This work deals with group counselling, its benefits and limitations, its types of groups, its requirements for leaders, and its realisations - especially the realisation in a school context with a focus on psychoeducational groups. The main source in literature will be Gerald Corey, and Gerald Corey & Marianne Schneider Corey respectively, as the two psychologists have published many books about counselling in the USA and give a broad overview on this field in America. 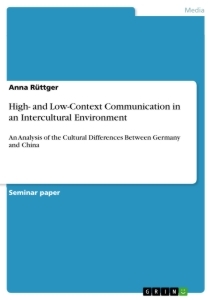 The focus does have to be on the situation in the US since this kind of group counselling at schools is not used in Germany yet, as current research pointed out.1 Therefore, it always has to be kept in mind that the essay reflects an American point of view. Additionally, the types of groups presented in this work only include participants who take place in group counselling voluntarily. For further readings on how to deal with members who are e.g. court-referred, please see Corey and Schneider Corey 1997, 331ff. The generic masculine is used throughout the work in order to provide an easy legibility. Thus, when using male pronouns, female persons are always included as well, unless the opposite is explicitly mentioned. This shows how important it is to identify clear goals and the purpose of the counselling group in the beginning, as well as the personal goals and hopes the individual member has (see chapter 3). In this kind of group, the leader functions as a kind of assistant who helps the members reach a work goal by applying the principles and processes of group dynamics8. He helps the group to work together more effectively and efficiently by correcting and enhancing their performance. He could also “develop skill in organizational assessment, training, program development, consultation, and program evaluation.” Groups for which this kind of counselling can be meaningful are e.g. task forces, planning groups, community organizations, study circles or learning groups. The leader training “involves course work in […] organizational development, consultation, and management”9 and should take at least 30, better 45, hours of leading or co-leading such a group under the supervision of an expert. This focus on learning is probably the reason why groups of that sort are increasingly found in schools and college counselling centres. As in Task/Work groups, the leader should be trained 30 or 45 hours; in this case in the fields of “community psychology, health promotion, marketing, consultation, group training methods, and curriculum design.”15 Additionally, the leader has to have content knowledge about the field he is working in, e.g. living with AIDS, stress management or substance abuse prevention. According to Corey and Schneider Corey, the group should meet for 4-15 weeks, taking 2 hours per session (or, when working with children, 30-45 minutes). In this kind of group, the focus is on problems that are quite ‘normal’, i.e. occurring in many people’s lives, but, nevertheless, are difficult to deal with. The individuals are ‘rel- atively well-functioning’, as Corey and Schneider Corey called it before, but have issues that hinder them in daily life, e.g. “[n]onsevere career, education, personal, social, and developmental concerns”17. The group leader helps the members to activate and develop their inherent problem-solving skills so that they can better cope with similar situations in their future life. The group leader should have experienced as much course work as possible, but has to do at least one course beyond the general training. Moreover, the counsellor should be educated “in the broad areas of human development, problem identification, and treatment of normal personal and interpersonal problems of living.”18 At least 45, better 60, hours of leading or co-leading such a group under the supervision of an expert are required. This kind of group differs from the other ones in terms of seriousness of problems: Group members have more severe emotional and psychological problems that need to be treated professionally, i.e. acute or chronic mental or emotional disorders that evidence marked distress, impairment in functioning, or both. Because the depth and extent of the psychological disturbance is significant, the goal is to aid each individual in reconstructing major personality dimensions. 45, better 60, hours of leading or co-leading a therapy group under the supervision of an expert are required. It is crucial that the leader has knowledge about “abnormal psychology, psychopathology, and diagnostic assessment” 19 in order to be able to treat troubled members adequately. Despite the 20presentation of different types of groups above, it shall be made clearer in this chapter that and why group counselling is not to be confused with group therapy. Group therapy started ‘coincidentally’ - during the Second World War, there was a shortage of professionals who could provide individual therapy, so individuals were treated in groups. Over time, it was found out that the group setting did not only have practical ad- vantages, but, above all, provides a unique way of therapy: Interaction and communication among the group members are the crucial features for change - members provide and, in turn, experience “support, caring, confrontation, and other qualities not found in individual therapy.” The tools and strategies the group members learn can be tried out in the group context which gives them security and feedback without being confronted with a real life situation. The problems dealt with in group therapy are of a severe nature. Thus, the goal is remedy rather than development or prevention, namely the cure of “a specific emotional or behavioral disorder that impedes people’s functioning”, e.g. in cases of depression, anxiety, psychosomatic symptoms, or sexual problems. 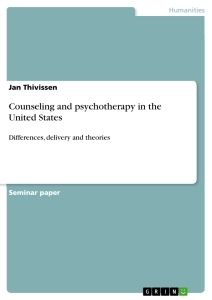 An important difference between therapy and counselling is the aspect of consciousness and unconsciousness: In group therapy, unconscious factors that have to do with and/or lead to the contemporary problem are made aware so that it can be worked on them. The past of the member plays a major role; the aim is to “[reconstruct] major aspects of the personality”. That is why therapy groups normally exist longer than other groups. The counsellor has to structure the group’s activities, has to act as a facilitator in members’ interactions, has to provide information about alternative ways of behaviour, has to encourage the members to transfer their insights into concrete plans and has to create personal goals that will shape the group’s direction. In that way, they can see themselves as they did in their families and relive conflicts they had. They can also practice newly learnt kinds of behaviour with the support and empathy of the other members and subsequently find out what they would like to alter and how they can do it. During the process, they can learn to overcome stereotypes and accept cultural and other differences amongst the members and feel a sense of belonging in the way that members might be different, but also alike regarding their struggles, problems and emotions. 1 Research on the internet was carried out by me and XXXXXXXXXX in June and July 2009 as we were searching for examples of group counselling at German schools and found none. 2 Aronson et al. 2004, 355; underlined by E.R. 5 Due to the relative briefness of the essay and its focus on counselling I will not fully explain the various types of groups existing in social psychology (such as ‘Primärgruppe’, ‘Sekundärgruppe’, formal and informal groups) but only present those ones relevant for counselling practice in further detail. 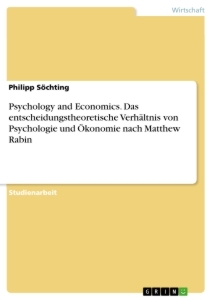 A very short overview is given on BR-online (n.d.): „Man kann die Primärgruppe, wie etwa die Familie, von Sekundärgruppen wie Arbeitsgruppen oder Schulklassen ab- grenzen. 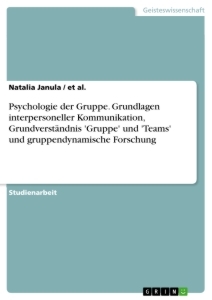 Entsprechend der Gruppenzugehörigkeit ist die Eigengruppe (‚ingroup’) von der Fremdgruppe (‚outgroup’) zu trennen.“ Crisand & Kiepe (1996) present an overview on informal groups, i.e. people who share the same interests and are connected emotionally, such as a clique, and formal groups, i.e. groups who are not connected emotionally but are composed because of outside decisions, such as a class at school (cf. Crisand & Kiepe 1996, 67ff.). 6 All quotes: ASGW in Corey & Schneider Corey 1997, 9. 7 Cf. Corey & Schneider Corey 1997, 9ff, and Corey & Schneider Corey 2006, 11f. 9 All quotes: Corey and Schneider Corey 1997, 9. 11 All quotes: Corey and Schneider Corey 1997, 9. 12 All quotes: Corey & Schneider Corey 2006, 11. 15 Corey & Schneider Corey 1997, 9. 16 Corey & Schneider Corey 2006, 11. 17 Corey & Schneider Corey 1997, 10. 20 Cf. Corey and Schneider Corey 1997, 11ff. 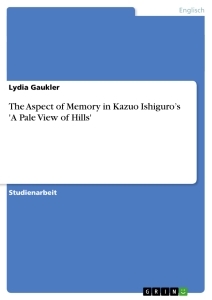 21 All quotes: Ibid, 11. 22 Ibid, 12; italics by E.R.